Display is 8 digits, green VFD. Elektronska industrija-Niš, made in Yugoslavia (now Serbia). 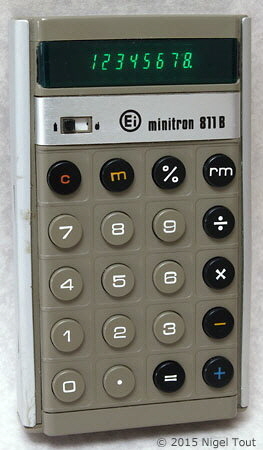 Ei (Electronics industry) Factory Calculating Machines Niš. 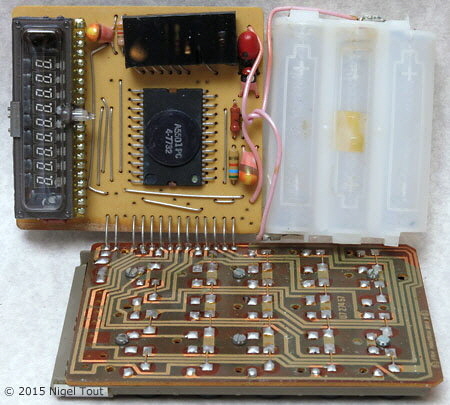 The circuit board showing the A5501PC integrated circuit (here date coded 1977, week 32). This does not have a manufacturer's mark but is clearly of Rockwell heritage and has a Rockwell part number. The black rectangular block above the integrated circuit is unusual and contains encapsulated discrete components.